Chinese winter melon soup is a popular dish that is often served in Chinese households and at Chinese banquets. Winter melon usually has a light refreshing sweetness with a soft texture once cooked. However, it does not contribute a lot of taste to a dish and instead absorbs the flavors of the ingredients it is combined with. Chinese people believe winter melon is a Yin food that can help our bodies to counter the summer heat and humidity. 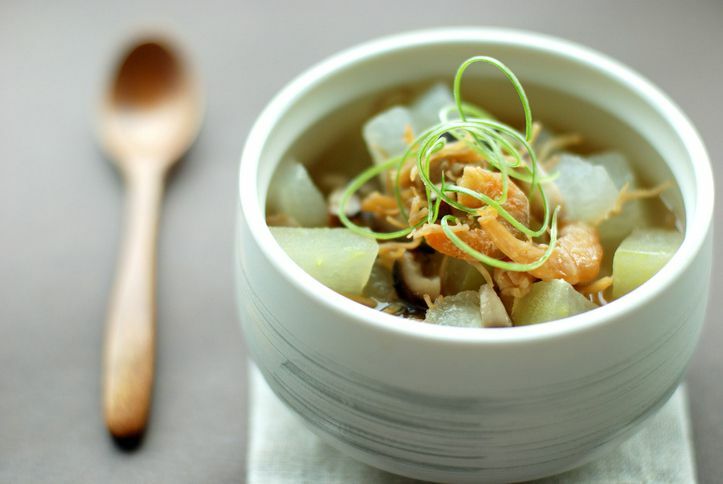 There are many different methods to prepare winter melon soup; this recipe uses shiitake mushrooms and ham. If you have trouble finding Chinese ham, you can replace it with another cured ham. Wash the winter melon, remove the green skin, seeds, and pulp. Cut into 2-inch pieces. Place the winter melon in a pot of water, bring to a boil, and simmer for approximately 20 minutes or until the winter melon is tender. Reconstitute the dried shiitake mushrooms by soaking in a bowl of cold water for 20 minutes until softened. Squeeze out any excess water. To the pot, add the mushrooms, chicken broth, ginger, and cooked ham. Add salt and pepper to taste. Simmer for about 20 minutes. Add green onion for garnish and serve hot. If winter melon is unavailable, you can use a whole cucumber instead; just keep in mind the flavor will be quite different. If you use cucumber, make sure you peel it, remove the seeds from the core, and dice. To make this dish a bit fancier and more impressive, purchase a whole 8 to 10-pound winter melon; cut off the top, remove the seeds and pulp, and place the other ingredients inside. Steam for 1 to 2 hours. It is easy to add to this simple soup without altering the recipe's intention. Feel free to replace the ham with barbecued pork and/or shrimp, or add along with the ham. You can also include other vegetables such as bamboo shoots, carrots, or silk squash. In addition to helping cope with the heat and humidity of summer, this fruit has other health benefits as well. Winter melon is high in dietary fiber which can help control high blood sugar levels and reduce cholesterol and lipid levels. It is also rich in vitamin B1 and B2 and is high in potassium. Winter melon can moisten the skin and enhance one’s beauty and will also help your urine production and increase the health of your kidneys.